Different Beast is the place that nurtures my occasional nostalgia for London (I lived there for two years). It is the breakfast/ brunch menu, the interior design, the colours and the music which bring to mind the pretty side of the city. The two owners, Alex and Evita, left their jobs in busy London to pursue their dream and make a little paradise in a calm corner of Kifisia, bringing all their influences with them. Until 19:00, the menu has choices like eggs with avocado, the amazing toastie with a variety of Greek cheeses and pancakes with bacon and chili chutney as well as a few healthy dishes like muesli and quinoa salad. From 19:00 there’s a different dinner menu. Please note that the menu is being updated regularly. The interior is a mixture of urban decor with English countryside touches and a visible kitchen. I love watching the cooks prepare all the delicious dishes. It’s kind of like watching Tasty, only live and with more style! 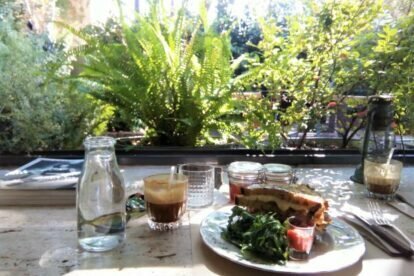 The nice decor along with the indie-folk tunes and the green surrounding make a wonderful atmosphere while the excellent quality coffee and food make it worth the ride up to the north of Athens.